This one is designed for the DJ’s who like Pioneers CDJ’s but want an all in one component. This new controller is biggest on the market, which comes with a big jog wheel like the CDJ’s. Its 8.1” wheel provides accurate and smooth performance for mixing and scratching. Its on-job display illustrates playback status position and cue points. It also allows users to change the resistance of the wheel from light to heavy for a custom feel. The DDJ-SZ has four effects buttons, Hot Cue, Roll, Slicer and Sampler. Under the effects buttons are eight large performance pads that you can quickly access to insert different modified effects to music playing. In Sampler mode, the output volume of the sampler effects also varies depending on the strength of user’s tap of the pad. The pads illuminate in different colors to show what effect mode it’s in. 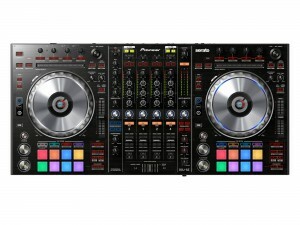 The DDJ-SZ mixer looks like the Pioneer DJM series mixer. It can be used as a standalone four-channel mixer for connecting turntables. This mixer comes with Sound Color FX functions (Pitch, Jet, Echo and Filter), which add audio effect combinations and arrangements to currently playing music with a simple twist of the knobs. Through Serato DJ’s beats per minute (BPM) analysis, users can also synchronize Echo effects to the BPM of currently playing music. The DDJ-SZ mixer also comes with a new Oscillator on the right side of the mixer that provides four types of sound effects: Noise, Siren, Cymbal and Horn. A quick touch of the buttons activates the effect(s), which can also be modified in amplitude (volume) to add to the music currently playing. It also comes with a Magvel cross fader that utilizes a contact-free magnetic system that can withstand more than 10 million operations. The “cut in” time of the cross fader can also be customized to the user’s preference. This is the same fader that’s in the Pioneer’s DJM-900SRT. The DDJ-SZ also comes with two USB ports that allow switching between computers extremely easy. This controller also comes with all the features that are included in Serato DJ software. Pioneers “Rekordbox” mobile app. Pioneer releases the new PLX-1000 Professional Turntable.